The A Series Self-Closing Industrial Safety Gates by Fabenco are an effective and easy-to-install passive fall protection solution for industrial and commercial settings. These self-closing safety gates feature a highly durable stainless steel spring that automatically closes the gate after each swing, providing near-continuous protection from leading edge falls. The A Series is made from carbon steel, but is also available in aluminum and stainless steel for special applications and environments. Designed to fit on handrails of all sizes, these industrial safety gates are capable of mounting in both left and right positions, as well as in standard or 90° positions with just a wrench and socket set. 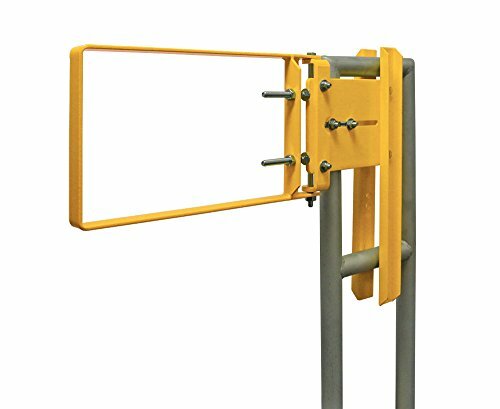 Each safety gate comes in your choice of finishes including galvanized and environmentally-friendly safety yellow powder coated. If you have any questions about this product by Fabenco, contact us by completing and submitting the form below. If you are looking for a specif part number, please include it with your message.